Around the holiday season, on social media, stories relating to the Bible tend to pop up. When my wife mentioned a New York Times story about “Gabriel’s Revelation” on the second day of Christmas, I was suspicious. The story, which was nearly a decade old—the internet keeps things in circulation far longer than those old library tomes consisting of physical newspapers bound together—describes the unprovenanced inscription as predicting a messiah will rise after being dead for three days. I assumed this meant evangelicals would be overjoyed, but it turns out that the artifact, if authentic, predates the New Testament. That means that it can’t be traditionally ascribed as a prophecy, since it’s not in the Bible, and therefore it becomes a threat because it suggests Jesus’ story isn’t unique. This is an interesting dynamic. A potentially important ancient artifact can only have value if it’s in the Bible or proves the Bible “true.” When that happens the faithful crow about how the evangelical position was right all along. If such a document implies that the gospels were borrowing from widespread cultural assumptions, however, it becomes just another unimportant bit of junk from days gone by. Confirmation bias, of course, is something in which we all indulge. Nobody likes being wrong. The difference is that the scholar is obliged to admit when the evidence overthrows his or her position. New options have to be considered. Since I was between jobs in 2008 when the inscription was announced, it escaped my notice. Now that nine years have settled the dust a bit, there seems to be no sustained case for declaring Gabriel’s Revelation a forgery. Neither does it appear to have changed Christianity at all. The period known as that of Second Temple Judaism has shown itself to have been rich in messianic expectations. We know little, historically speaking, of Jesus of Nazareth. We know from the Dead Sea Scrolls that some were expecting a messiah along the lines of what Jesus was said to have been. But those documents aren’t part of the magical book that contains the truth, the whole truth, and nothing but the truth. In as far as they back the Bible up, they are celebrated. When they call the Good Book into question, they are rejected. I have no idea whether Gabriel’s Revelation is authentic or not. It seems pretty clear, however, that a faith that’s based on one unquestioned source might be more fragile than even other artifacts that have managed to survive, somehow, from ancient times. Nothing fascinates quite like the Dead Sea Scrolls. That is, unless you’re a disgruntled Ugaritologist. Mention the Dead Sea Scrolls and the journalists will form a queue. Never mind the relative importance of Ugarit. But I digress. There is something quite dramatic about the discovery and recovery of the scrolls. It involves science and sculduggery and that utterly captivating name “Dead Sea.” This past week the scrolls were in the news again as a new technology was used to read an illegible roll. The New York Times story by Nicholas Wade describes how something like a CT scan can be used to find the ink on an unrolled scroll and software can be devised that associates the ink to its nearest surface. A little virtual unrolling and you have a legible document that has no visible letters that the naked eye can see. Turns out this one happens to come from Leviticus. Figures. You might think this would lead to joyful leaping on the part of someone who used to make a living reading ancient documents, but such are the times in which we live that even silver linings turn to lead. Years ago I learned about Van Eck phreaking from Neal Stephenson. I thought it was sci-fi, but in fact it is a legitimate—or illegitimate—method of reading a person’s electronic device without being able to see the screen. Since so few people are eager to read my blog, I can’t think anyone would be wanting to spy on my laptop. Nevertheless, with the advent of new technology that can—think about it—read a closed book, I have to wonder about the implications. Reading some dead scribe’s Dead Sea Scroll is one thing. Your sister’s locked diary can be quite another. Being more of a clay-and-stick man, I was pleased when it was discovered that rapid flashes of light around the circumference of a clay tablet could lead to a virtual computer model that could be rotated 360 degrees with illumination from any angle. The technology had other applications as well, of course. (It certainly wasn’t developed to read forgettable texts.) With a clay tablet we can be reasonably certain that nothing too private was being impressed. But then that’s what you’d expect an Ugaritologist to say. It seems that my days of reading ancient documents are a closed book anyway. But that’s just the problem. Not even a closed book is safe any more. If I were in any danger, I’m sure it would show in my stats before anyone bothered to park a nondescript van outside my door and scan through all the countless tomes with which I surround myself daily. But I do wonder. Despite her ability to overlook my obvious deficiencies, my wife has good eyesight. 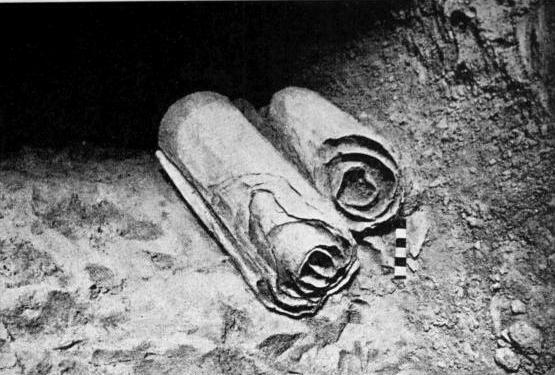 Last week she spotted an article carried by the Associated Press entitled “Dispute over ancient scrolls changes modern law.” Although many ancient documents (notably those from Ugarit) outweigh the importance of the Dead Sea Scrolls for understanding the religion of ancient Israel, the Scrolls have continued to be headliners. There never seems to be some sort of scandal very far from the Scrolls, and this article by Jennifer Pletz reaffirms that assessment. The name of Norman Golb is familiar to just about any Hebrew Bible scholar. His work on the Scrolls is highly regarded. The story, however, brings the scandal down a generation to Golb’s son Raphael, a lawyer and literature scholar. In a case whose details rival the minutiae of the Scrolls themselves, the younger Golb is accused of sending emails putatively said to have been sent from his father’s rivals confessing plagiarism. To what point, beyond alleged family honor, one hesitates to speculate. “Sculduggery,” J. C. L. Gibson once said, “is always just around the corner in archaeological circles.” The same might be said to apply to the Scrolls. Episode after episode of scholars behaving badly have attended the controversial documents since their accidental discovery on the eve of Israel becoming a state. Ironically, the Scrolls in some symbolic ways represent the struggles of the Israelis. No one doubts their importance, but access has always been an issue. Careers were made and secured by the Scrolls, reaching to the highest academic offices in the land. And yet, we can learn more by turning back the pages of history just a little further. The Scrolls date from that troubled time period when Christianity was just beginning to emerge from Judaism. Tempers flare at implications masked or insinuated. As if the Scrolls were really the much sought philosopher’s stone. The original generation of Scroll readers is going the way of all nature. Those associated with the more solid tablets of Ugarit have long passed that way already. And yet we still have Bible museums being built and implications left dangling. Law suits are filed and ownership of the Scrolls is disputed. In the twenty-first century scholars are still willing to risk it all on some parchment fragments that have the appeal of the esoteric. Hidden truths, almost apocalyptic, squirreled away in desert caves. Knowledge is indeed money, unless, of course, you actually know how to read the Scrolls for yourself. A friend recently pointed me to a story of a “new” manuscript, recently discovered, that portrays Jesus predicting the advent of Mohammad. The article on sott.net, suggests that the manuscript, wanting to be seen by the Pope, may be the Gospel of Barnabas. 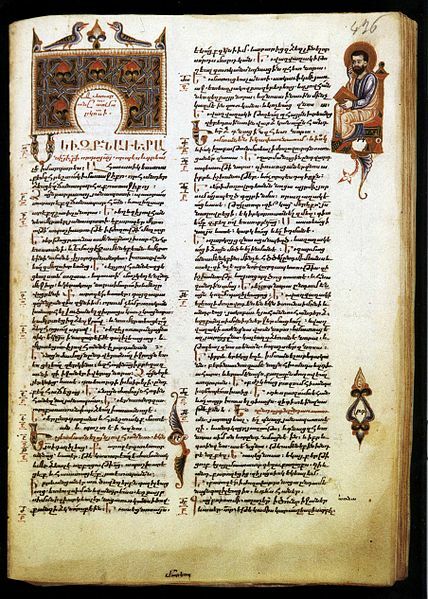 Of course, the Gospel of Barnabas is already known from a medieval Italian manuscript and a new, authentic discovery would be of great excitement to epigraphists and text critics, but few others. Barnabas is not a canonical gospel and is considered by the majority of scholars to have come from centuries after the fact. Quite apart from the sensational headline “1,500 year-old Bible found in Ankara, Turkey: Vatican in Shock!” (posted in September of last year, before Francis came along), the manuscript raises a number of questions concerning what one colleague calls “the iconic book.” To be sure, there are documents yet to be discovered. The Bible, however, will not be reconstituted and the door has long been sealed shut on written revelation. What remains is the perception of sacred books. How many movies and novels are based on the premise that an ancient document has been discovered and suddenly everything about the world changes? It is a common enough theme. This idea is based on the magical concept of scripture—the hidden wisdom of the ancients somehow overrides all that we know of the world. It lies in some cave or monastery or synagogue, waiting to be discovered, unleashing divine power. No doubt the dramatic (and dramatized) discovery of the Dead Sea Scrolls plays into this mythos. Nobody knew they were there, but suddenly, new information! How many people on the street today, however, can say anything of what was contained in the Dead Sea Scrolls? They’ve been mulled over by furrowed-browed scholars for over half a century, but haven’t triggered any apocalypses, at least not yet. There are hidden documents. Working for Gorgias Press put me in the place where I could learn about some texts kept under lock and key in remote monasteries in Syria. They are generally kept for their monetary value rather than their spiritual revelations. The manuscript on sott.net made me think of those manuscripts for the first time in years. In all likelihood, if a manuscript is being hidden it is lucre, not illumination, that is at stake. The Vatican library, researchers who’ve been there tell, requires immense patience and a willingness to be repeatedly turned away. There’s just something about those old texts. No surprise that the Bible and Qur’an lead to such fiercely protective sentiments in some believers. In the meanwhile, I wouldn’t advise selling all your possessions and anticipating the apocalypse. Unless, of course, you take some ancient documents literally. An ancient manuscript (not the hidden one). “Male and female created he them; and blessed them, and called their name Adam,” so reads Genesis 5.2 (5.2a, for those sticklers among the crowd). Long ago I lost track of how many times I’d read Genesis. It has a privileged place in the Bible partially because of our modern method of reading books. We assume that the beginning should be read first and that it should lay the groundwork for what follows. The Bible, however, was compiled over centuries and the story may begin at Genesis, but not all that follows is in agreement with it. “Called their name Adam” sent me scurrying back to dust off my Hebrew of the Bible. The King James Version, after all, was translated from manuscripts that are sometimes inferior to many that have been discovered since then, including the Dead Sea Scrolls. Maybe this was one of those strange Elizabethan passages, for after all, Queen Elizabeth I did have a bit of a reputation. To my surprise, however, “their name” remains plainly in the Hebrew, suggesting that the first couple were both Adam. 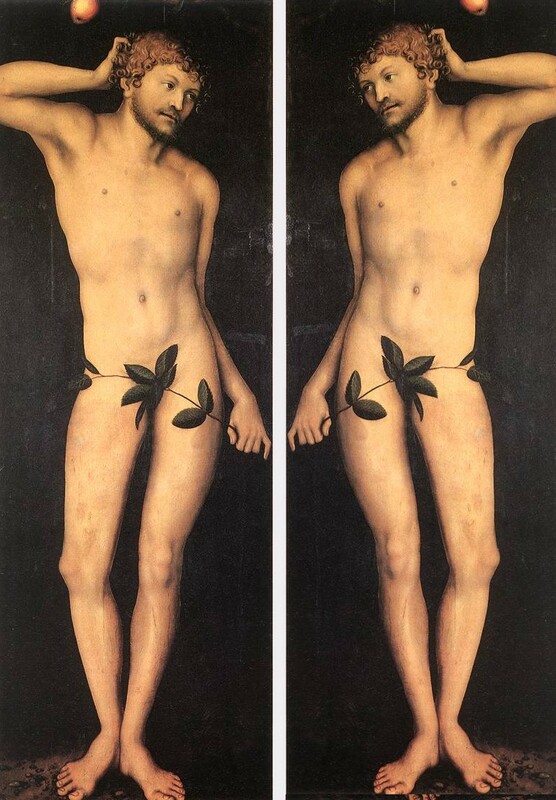 Since just a verse later Adam and Adam have a son called Seth (and since the genealogies seldom mention their women at all), presumably Adam here means Eve. Literalists beware! The creation story in Genesis 1, as opposed to Genesis 2.4b, pictures the genders created simultaneously. Women and men together are humanity. The second creation story offers Adam a generous dollop of primacy; he gets to be first and even gets to name the animals and the wife; he is the lord and master of his domain. And people refer to eating the fruit as a fall! Now at Genesis 5 we have humanity reunited in the person of Adam, the bi-gendered representation of humanity. Of course Adam is a play on words. The Bible begins with humanity as a joke. Adam is just one syllable short of the word for “ground” (adamah), and so Adam is the original groundling, or earthling. Yet Adam is never given as a proper name until Eve appears. It is only with the creation of woman that man becomes man. I suspect that may be the underlying of logic (if it is even right to call it such) of the plural, “their name Adam.” It might be easier just to recognize that the Bible doesn’t give us the endpoint of the discussion of human nature, but the starting point. There are those who insist that the Bible has all the answers. In my experience it is primarily full of questions. And the questions require both female and male to answer them. Otherwise, humanity is indeed a joke.